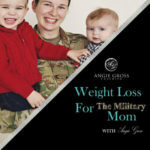 Welcome to the 12th episode Weight Loss For The Military Moms Podcast. This episode I talk about the different ways we sabotage getting the body we want. I was so close to eating ice cream because my son hid my phone. I thought eating ice cream was the solution, but my conscious brain was able to find that sabotaging thought. Listen to the different ways that your subconscious brain may be sabotaging your results.